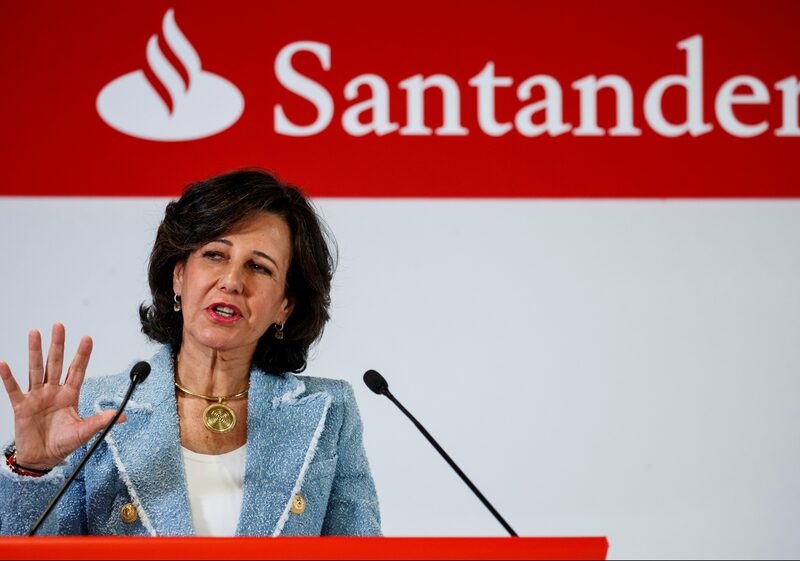 Spanish bank Santander's Executive Chairman Ana Botin gives a speech at the annual results presentation in Boadilla del Monte, outside Madrid, Spain, January 31, 2018. Banco Santander on Jan. 30 reported net profit of 7.8 billion euros for 2018, an increase of 18 percent over the same period the previous year. Stripping out one-off charges, net profit rose by 7.3 percent to 8 billion euros. Total revenue rose by 0.1 percent year-on-year to 48.4 billion euros, or by 8.9 percent in constant currency terms. The Spanish bank’s costs were equivalent to 47 percent of its revenue over the year, broadly unchanged from the same period of 2017. Return on tangible equity rose to 11.7 percent, compared to 10.4 percent a year ago. Santander’s common equity Tier 1 capital ratio rose to 11.3 percent from 10.8 percent. The bank proposed a dividend of 23 cents per share, a rise of 4 percent year-on-year. Santander shares were flat at about 4.3 euros by 0921 GMT on Jan 30.